Massachusetts Set To Approve Law Protecting Access To Birth Control The Massachusetts law would make it the first state to circumvent a federal policy allowing any company to opt out of providing free birth control coverage due to a religious or moral exemption. 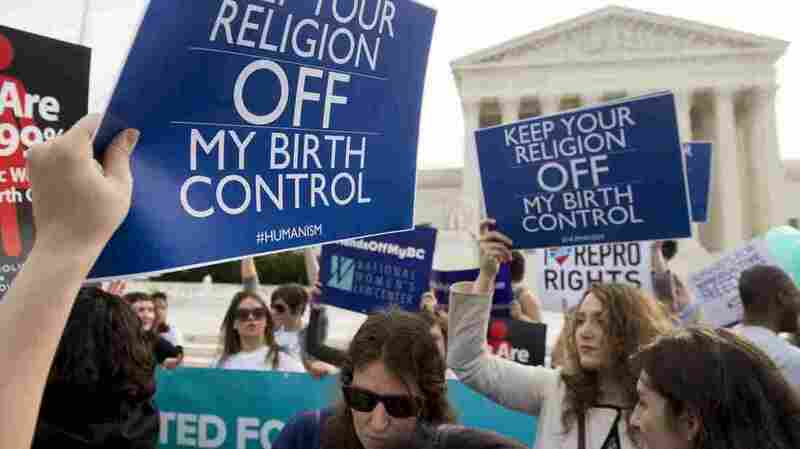 Supporters of women's health rally outside the Supreme Court in Washington, D.C., March 23, 2016, as the Court hears oral arguments in seven cases dealing with religious organizations that want to ban contraceptives from their health insurance policies on religious grounds. Massachusetts Gov. Charlie Baker was expected to sign legislation on Monday that would cement in state law the Obama-era mandate for free birth control regardless of changes in federal policy or future repeal of the Affordable Care Act. The bill quickly sailed through the state legislature earlier this month, after President Trump signed an executive order in October allowing any company or nonprofit organization to opt out of providing coverage due to a religious or moral objection. The Massachusetts law will go into effect immediately after it is signed, though insurance companies have six months to implement the changes, Carey Goldberg, editor of WBUR's CommonHealth blog, tells Here & Now's Robin Young. The law is "basically saying to Massachusetts women, 'Look, don't worry. No matter what happens in Washington, here in Massachusetts your birth control is going to stay covered and free' " with no co-pays, she says. The law also goes one step further and expands coverage, Goldberg says, by allowing insurers to cover a full year of birth control pills at once and emergency contraception, such as the morning after pill, must be covered without a prescription. After Trump approved the policy change, the Department of Health and Human Services said only a small percentage of women would likely be affected by it. They said only about 200 companies who sued the federal government after the Affordable Care Act became law are expected to request waivers. But some health policy experts warned the new rule creates a loophole that allows any employer to claim an exemption, which would require female employees to pay the full cost of birth control out of pocket. Adam Sonfield, a senior policy manager at the Guttmacher Institute, echoed that concern, telling NPR last month "these new exemptions are sweeping," adding that there are no provisions in the law to appeal them. Goldberg says the Massachusetts law essentially circumvents the executive order and any future policy changes at the federal level. "Massachusetts insurers can only get an exemption from this law and opt out if they're a church or another religious institution," she explains. "If they don't qualify for that category, then they can't opt out of birth control coverage, and if they try, that's probably a matter for the courts." In fact, Trump issued the new rule in response to the Supreme Court's split rulings on the issue. Several organizations filed suit against the birth control mandate, which says all employer-provided health insurance must cover preventative health care, including "all Food and Drug Administration approved contraceptive methods, sterilization procedures, and patient education and counseling for all women with reproductive capacity." In 2014, the court ruled in favor of the Hobby Lobby chain of craft stores, saying private companies could reject the requirement on religious grounds. In a similar suit brought by the Catholic religious order The Little Sisters of the Poor, the justices were divided, arguing the nuns shouldn't face fines for refusing to follow the rule. The court ordered both sides to work out a solution, but before an agreement was reached, Trump changed the rule. More than a dozen states have already moved to shore-up birth control laws since Trump took office, according to the Guttmacher Institute. Though Massachusetts legislators have been working on this bill for months, the fast, near-unanimous passage of the law sends a message to the Trump administration and other states, says Elana Margolis of Blue Cross Blue Shield of Massachusetts. "We're setting an example. We're showing how different thoughts and opinions can come together and find common goals," she says. "And we're saying that we're willing to move first, fast and frankly, furiously to get it done."